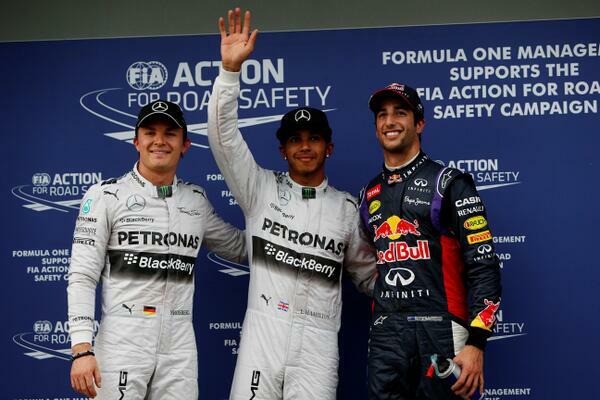 Home » Formula One: Hamilton on pole ahead of home hero Ricciardo! Lewis Hamilton has taken pole position for tomorrow’s 2014 Australian Grand Prix; the first race of the season and the first race using the new V6 turbocharged engines. The Mercedes driver had been expected by many to take the pole position after a strong pre-season testing for the Silver Arrows and duly delivered in the wet conditions. Australian driver Daniel Ricciardo will line up in an unexpected 2nd place after a strong showing throughout the hour session. Team-mate Sebastian Vettel failed to make the top ten shoot-out and will start 12th. After Nico Rosberg had taken the fastest time in final practice, it looked to be an exciting fight between the two Silver Arrows for the first pole position of the season. The track was dry but the sky was grey as the rain looked threatening on the horizon. Many drivers queued up to leave the pit-lane, including Hamilton and Rosberg. The rain held off long enough for most of the drivers to set a dry lap time, with Pastor Maldonado being the only man who failed to do so. Team-mate Romain Grosjean also struggled, which many had believed would be the case following a poor pre-season for the Enstone squadron. Neither driver made it into Q2 and the pair will start in the final two positions on the grid for tomorrow’s race. The Marussia’s and Marcus Ericsson were also eliminated in the first session, with Max Chilton managing to beat his team-mate to 17th place. Esteban Gutierrez joined them in his Sauber and was also hit by a 5 place grid penalty for a gearbox change. Kamui Kobayashi managed to bounce back from Caterham’s almost non-existent amount of running yesterday to get himself into the second qualifying session. Daniel Ricciardo set the fastest time of the session, much to the home crowds delight. Rookie Kevin Magnussen and Felipe Massa were 2nd and 3rd fastest. The rain had started to fall during the first qualifying session and by the time the second session was green-lit, the intensity may have eased, but the track was still wet enough for Intermediate tyres. Nico Rosberg took the top of the time-sheets early, half a second clear of Massa’s Williams, Vergne’s Toro Rosso and Hamilton in the sister Mercedes. Valtteri Bottas took the top spot away from Rosberg during the session as the track began to dry out. This allowed for a multitude of lead changes in an exciting end to Q2. Lewis Hamilton took provisional P1, with Ricciardo moving into second; just a few thousandths slower than the 2008 world champion. Jenson Button then managed to get into the P1, with Ricciardo managing to beat him moments later! It was Alonso’s turn to take the fastest lap, but team-mate Raikkonen didn’t have the same opportunity. He caught traffic at the end of his lap which forced him into the 8th fastest position. The Finn tried to improve but lost control of his Ferrari at turn 4, hitting the wall and wiping the nose off of the car. He ended the session in 12th. Raikkonen was one of three world champions eliminated in Q2 as he finished just behind 2009 winner Button and ahead of reigning champion Sebastian Vettel! Sebastian later went on to say that he struggled with the ‘drivability’ of his RB10. To add insult to injury, the sometimes unpopular quadruple world champion was booed as he walked back to the Red Bull garage. Red Bull sister team Toro Rosso managed to get both cars into the top 10, including Russian rookie Daniil Kvyat. This was despite the two drivers having worried after braking problems in practice. The Toro Rossos were joined by both Williams cars, Nico Hulkenburg’s Force India, Kevin Magnussen’s McLaren, Fernando Alonso’s Ferrari, Ricciardo’s Red Bull and the two Mercedes cars. Nico Rosberg topped the session. The rain had started to pick up again in the closing minutes of the second session. As the extended, 12 minute top 10 shoot out got under way, all the drivers bar Alonso emerged onto the circuit on the full wet Pirelli tyres. Alonso head out onto the track on the Intermediate tyres, but the decision wasn’t working, so the Spaniard quickly came back into the pits for Wet tyres. Lewis Hamilton took the provisional pole early in the session ahead of Rosberg and Ricciardo, but as we approached the final few minutes of the session, it looked like it was possible to gamble with a move onto the Intermediates. Ricciardo was the only man to take this gamble as he sought to take an unpredicted pole position in his first race for Red Bull. 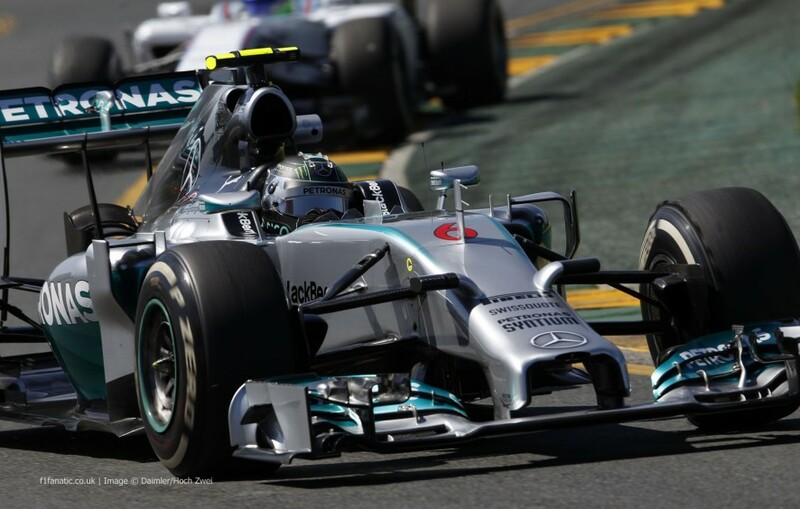 Rosberg’s pole chances looked to be slim as the German slid across the grass turn nine. This delay meant that even though he managed to go fastest on his next lap, everyone else would have one extra lap as they had crossed the line before the chequered flag had fallen. Daniel Ricciardo’s gamble paid off as the Australian took the fastest time away from Rosberg on his last lap. The crowd went mad for their home hero, but Lewis Hamilton was still yet to cross the line on his final lap. Hamilton soaked up the pressure to complete a stunning lap in his Silver Arrow to take pole position; three tenths of a second ahead of Ricciardo. Nico Rosberg managed to hold on to take third place on the grid. Kevin Magnussen managed to qualify in a fantastic 4th place, equalling the starting position of the last McLaren Formula One rookie; Lewis Hamilton. The Dane was just ahead of Fernando Alonso in his Ferrari. Jean-Eric Vergne managed to qualify in 6th place, his best ever grid position. Nico Rosberg was 7th fastest on his return to Force India. Rookie Daniil Kvyat took an impressive 8th on the grid, despite having hit the wall in the dying moments of Q3. The two Williams cars completed the top 10, somewhat disappointingly baring in mind they had been considered as the Silver Arrows’ greatest competition heading into the weekend. Bottas was also hit by a gearbox penalty and will start in 15th tomorrow. *Esteban Gutierrez and Valtteri Bottas received 5 place grid penalties for gearbox changes. Pole-sitter Lewis Hamilton: “It’s been an interesting weekend. Today it made it so much harder with the conditions but I’m really happy for the job the team did. Second placed Daniel Ricciardo: “It was exciting, definitely the weather added to the mix. The whole session went well. Not everyone was out with the options in the beginning, Q1 looked like it was going OK for us. Third placed Nico Rosberg: “I’m not sure what the others were doing – we didn’t get everything right, but we didn’t do much wrong, but all in all it was a good qualifying session. I’m pleased with third – we could do better, but at least with that a good race is possible.